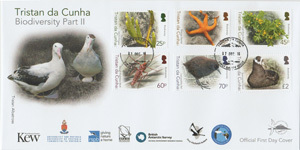 Stamps illustrating Tristan's biodiversity - Part II with Devil's Fingers, Orange Starfish, Gough Brass Buttons, Gough Flightless Moth, Inaccessible Rail, and Spectacled Petrel. Like most oceanic islands, the Tristan archipelago supports fewer species compared to a continental landmass of similar size, but many of the species found there are unique to Tristan. The islands are perhaps best known for their rich birdlife. 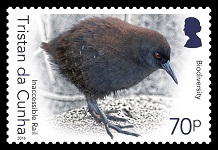 All seven landbirds are endemic to the islands, and include the world's smallest flightless bird, the Inaccessible rail. Seabirds dominate the vertebrate fauna; about 8 million pairs of seabirds, mostly burrow-nesting petrels, breed on the islands, including four species that only breed on Tristan's archipelago: the Tristan albatross, Atlantic yellow-nosed albatross, spectacled petrel and Atlantic petrel. Terrestrial plant diversity is modest, but 27 of 58 native flowering plants are found nowhere else, as are 14 of the 35 ferns. 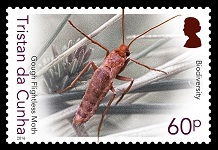 Less is known about the native invertebrates, but there are many unique species, including flightless moths, crane flies and fruit flies, as well as fascinating radiations of snails and weevils. Unfortunately, oceanic island ecosystems are particularly susceptible to invasions by introduced species. Tristan is lucky to have some of the least transformed temperate islands, but is still home to the greatest number of globally threatened terrestrial species of all the UK Overseas Territories. 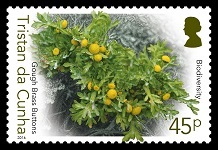 This stamp series celebrates the islands' extraordinary biodiversity. 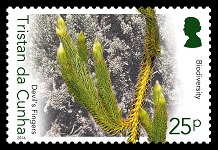 This common clubmoss, one of three species found at the islands, is easily recognised by its silvery sheen. The vegetative stems are creeping, with aerial stems up to 14cm long, often topped by reproductive cones. Devil's fingers are endemic to Tristan, Inaccessible and Gough. They occur up to 650m on Tristan, but only 450m on Gough. 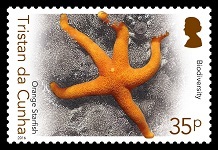 The orange starfish is present at Gough but not at the northern islands. The only starfish commonly seen in shallow water is the pale purple or pink species up to 6cm long. Two species of brass buttons - yellow-flowered perennial members of the daisy family about 10-20cm high - are endemic to the islands. The Gough brass button is confined to Gough Island, where it is locally common in coastal areas, especially where there is moderate trampling by seals and penguins. Flightless moths resemble small crickets more than moths: 12-15mm long, brown with tiny 3-4mm long wings they are perhaps the most interesting of the islands moths. Two species of Dimorphinoctua occur at the islands; one at the northern islands and the Gough flightless moth is confined to Gough Island, mainly above 300m. A second, smaller species of flightless moth also occurs at Gough, Peridroma goughi. As its name suggests, the Inaccessible rail is confined to Inaccessible Island. It has the dubious distinction of being the smallest flightless bird - there were smaller species on other islands, but they all fell victim to introduced predators. In the South Atlantic, flightless rails also occurred on St Helena and Ascension. The rail survived on Inaccessible thanks to the lack of introduced rodents. It is common throughout the island, but is hard to see as it shelters from predatory skuas in dense vegetation. 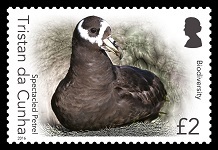 Like the Inaccessible rail, the ringeye or spectacled petrel is confined to Inaccessible Island, where it breeds in large, often muddy burrows on the island plateau. The species nearly went extinct in the early 20th century due to predation by feral pigs, but fortunately the pigs died out before they ate the last petrels. The population has been growing steadily ever since, with some 14,000 pairs estimated during the last count in 2009.